SuperMUC will build a high pressure materials database. Our computing project has just been accepted to run in the SuperMUC Petascale System. With more than 2.3 millions of computing cores at our disposition the grant in its first phase will serve to construct a database for materials under pressure. The project will runs until 2020 including a second phase with possible extension of the requested computing allocation. 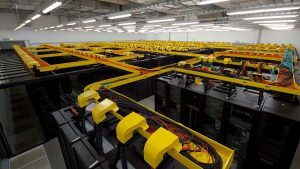 The supercomputer is SuperMUC ranked top 4 as the fastest supercomputer in Germany. It is composed of more than 147,000 computing cores. SuperMUC (the suffix ‘MUC’ alludes to the IATA code of Munich’s airport) is operated by the Leibniz Supercomputing Centre, a European centre for supercomputing. Stay tuned! coming months surely we will have very exciting news !